Food | Another Beautiful Day in Paradise! If the recipe is not shown, click on a picture to link to it. Sort and rinse beans; place in a large Dutch ove. Cover with water, 2 inches above beans; let soak overnight; Drain; set beans aside. Saute onion in hot oil in Dutch oven over medium high heat until tender. Add green chiles, garlic, cumin and oregano; cook 2 minutes, stirring constantly. 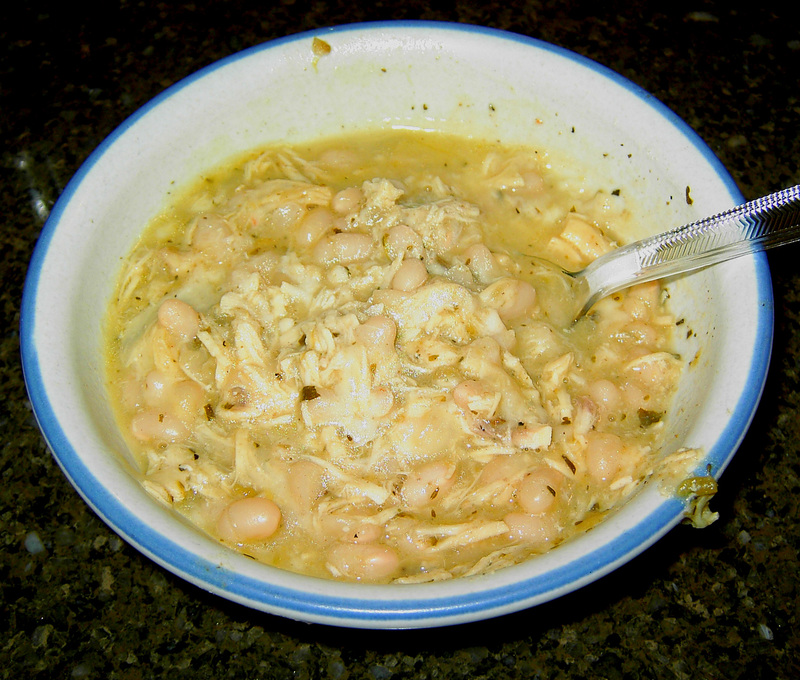 Add beans and chicken broth. Bring to a boil; cover, reduce heat, and simmer 2 hours or until beans are tender; stirring occasionally. Add chicken, 1 cup cheese, salt and pepper. Bring to a boil; reduce heat and simmer, uncovered, 10 minutes, stirring often. Stir in cilantro if desired. To serve, ladle chili into individual soup bowls. Top each serving with remaining 2 cups cheese. Yield: 13 cups. Saute together the onion, green pepper and Andouille sausage. Add ½ stick butter and melt. Add 3 heaping Tablespoons of flour and mix well. Cook slowly for 5-10 minutes until it becomes a light roux. Add ½ cup (or more if needed) of half and half. Add 1 lb peeled shrimp. 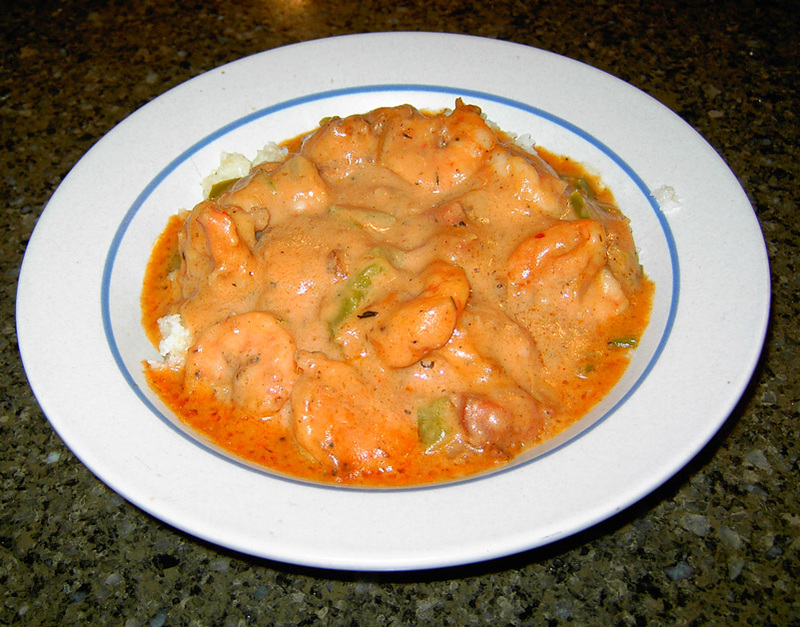 Serve the shrimp-gravy mix over the grits. A ham bone with chunks of meat still attached or some cut up left over ham, about two cups. A “ton” of chopped onion and celery. Easily two large onions and 4-5 celery stocks. A small can of tomato paste or tomato sauce. This is a project that is best started the day before. 1. ) You have to soften the beans. There are two ways to do that. The first is to soak them in a bowl over night. Of course if you are planning to eat in a couple of hours that might be difficult. The other is to put them in boiling water and simmer them for about 10 minutes and then let them sit for an hour. In either case, you should drain the beans through a colander before cooking. Do NOT cook them in their soaking water. The major issue with beans is the gaseous by-product that comes several hours after eating. Draining them before cooking with reduce that significantly. 2.) I also usually simmer the ham bone in several quarts of water for about an hour the day before and leave the pot to cool in the refrigerator over night. This allows much of the fat (and a ham bone DOES have fat) to congeal on the surface. You can easily remove it with a spatula before you begin adding the remaining ingredients. 3.) 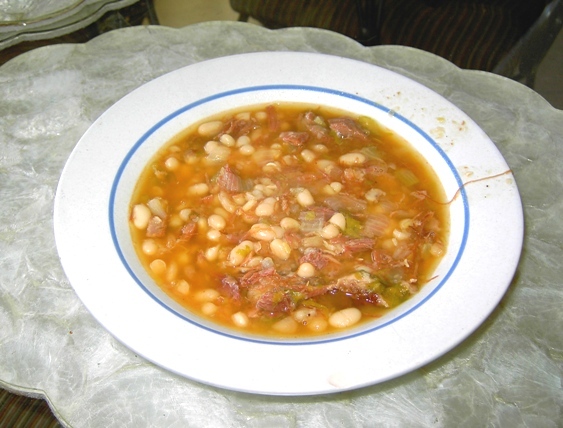 Once your beans are soft and your ham is ready, add the beans, onions, celery and bay leaf all into a pot. You should have so much onion and celery that it should look like they are the dominant ingredients. Bring it to a boil, then reduce to a simmer and allow it to cook for at least two hours, maybe more. The more you cook it, the more everything will meld together, which is what you want. Note: Keep a close eye when it starts to thicken that you don’t allow it to scorch on the bottom. Stir frequently and adjust your heat as needed. 4.) Before you are done, you need to improve the look of the soup. Cooked with the ingredients above, it will look like dishwater, very unappetizing. The finishing step for this soup is to take a spoonful of tomato paste or a dollop of tomato sauce and stir it into the soup. Use enough that it will turn the soup brown-orange, but not so much that it gets red and too tomato-y tasting. Add a little and see how it looks and tastes. Note: When simmering, keep an eye on the level of your liquid. You don’t want it to cook down to the point it is just a bean dish. Add more water as needed. You can serve “as is” or add a little grated cheddar cheese to it. Steak Pot Pie — Click on the photo for the recipe.